Stocks turned negative Friday amid concerns of a slowing US economy after the jobs report missed Wall Street estimates. The Dow Jones Industrial Average slid 2.5%, or more than 600 points. The Nasdaq Composite fell 3.2%, and the S&P 500 was down 2.6%. Stocks had earlier climbed on the back of renewed expectations for the Federal Reserve to pursue a slower interest-rate path. Semiconductor companies including Micron Technology (-4.9%) and Nvidia (-6.1%) were among the biggest losers. Technology giants were also lower, with Apple down nearly 3% and Intel 3.2% lower. The US economy added 155,000 jobs in November, well below expectations of 198,000, and the unemployment rate held near historic lows at 3.7%. Wages grew at a slightly slower-than-expected pace, rising 0.2% for a second straight month. 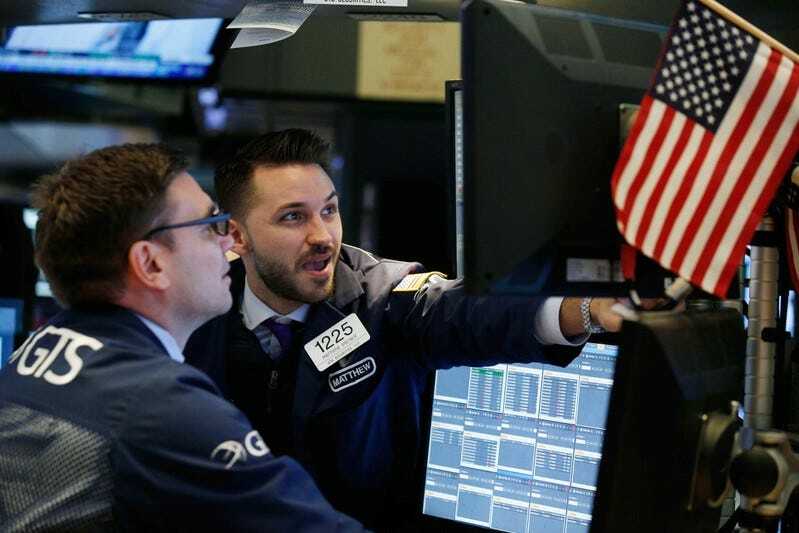 “For markets, of course, this is the new Goldilocks: still strong-enough job growth, but a more cautious Fed will be good for markets and overall business confidence,” said Josh Wright, the chief economist at iCIMS Inc.
Treasury yields seesawed as market watchers digested the report. After initially falling, the yield on the benchmark 10-year note erased its early losses and climbed back to unchanged near 2.895%. All eyes have been on rates this week after parts of the yield curve inverted, an occurrence seen as a potential recession signal. The dollar slipped against a basket of peers. Officials are still expected to hike the fed funds rate by a quarter percentage point to a target range of 2.25% to 2.5% next week, but the path for next year is less clear. Federal Reserve Chair Jerome Powell emphasized the strength of the labor market late Thursday, saying, “By many national-level measures, our labor market is very strong.” The Wall Street Journal had earlier reported the central bank might adopt a “wait-and-see approach” to future policy decisions. The S&P 500’s energy sector was little changed after the OPEC cartel of oil producers reached a deal to cut coordinated output levels. Oil spiked following the agreement, with West Texas Intermediate trading at $52.95 a barrel and Brent at $61.73. Prices are still in bear territory, however, losing nearly a quarter in value since the beginning of November. On the trade front, President Donald Trump said early Friday that “China talks are going very well!” Wall Street suffered its worst session since October on Tuesday following the arrest of Meng Wanzhou, the chief financial officer of Huawei Technologies. The incident cast doubt on trade relations between Washington and Beijing, which agreed last weekend to pause tariff escalations for negotiations. Elsewhere, Altria, one of the largest tobacco companies in the world, was up 0.2% after announcing plans to invest $1.8 billion in the cannabis producer Cronos.